Nazca Lines are the most outstanding group of geoglyphs in the world. Etched in the surface of the desert pampa sand about 300 hundred figures made of straight lines, geometric shapes and pictures of animals and birds - and their patterns are only clearly visible from the air. If you have Google Earth installed, use this Nazca Google Earth Placemark file (Save and Open) and it will fly you to a location*. If not, you will need to install Google Earth first (available at http://earth.google.com ). Google Earth streams the world over wired and wireless networks enabling users to virtually go anywhere on the planet and see places in photographic detail. This is not like any map you have ever seen. This is a 3D model of the real world, based on real satellite images combined with maps, guides to restaurants, hotels, entertainment, businesses and more. You can zoom from space to street level instantly and then pan or jump from place to place, city to city, even country to country. First, the straight lines, many kilometers long, crisscross sectors of the pampas in all directions (as shown on images above). Many of the lines appear to be random and seem to have no pattern to them. Second, many of the lines form geometric figures: angles, triangles, bunches, spirals, rectangles, wavy lines, etc. Other lines form concentric circles converging with or emanating from a promontory. Other prints have formed "roads" like geometric planes and appear to have been occupied by large groups of the population. Third, many lines form animal patterns. Could these geoglyphs be effigies of ancient animal gods or patterns of constellations? Are they roads, star pointers, maybe even a gigantic map? If the people who lived here 2,000 years ago had only a simple technology, how did they manage to construct such precise figures? Did they have a plan? If so, who ordained it? It all seems so otherworldly. To comprehend the Nasca lines, created by the removal of desert rock to reveal the pale pink sand beneath, visitors have proposed every imaginable explanation - from runways for spaceships to tracks for Olympic athletes, from op art to pop art, to astronomical observatories. It is believed that the geoglyphs were built by a people called the Nasca- but why and how they created these wonders of the world has defied explanation. As much as the lines awe us, we marvel equally at the imagination of the people who have sought explanations for them. Another strange "road" is located near Pisco in Peru. Satellite photo of the "Band of Holes" near Pisco Valley . Note: The location of the band of holes is highlighted brown. This is another strange road in the Pisco region in Peru. It is about 20m wide and goes for many miles through the desert. It is lighter than its surroundings and marked by small craters spread apart by approximately 200m. Compare Nazca lines with Area 51 desert "drawings"
The Great Sphinx of Giza belongs to the Giza necropolis west of Cairo. The site is a plateau containing the three great pyramids of Khufu, Khafra, and Menkaura, together with the Sphinx and a number of smaller pyramids, temples, and tombs. and the Late Dynastic (1070-332 BCE). The Sphinx is the oldest and longest stone sculpture from the Old Kingdom. During the eighteenth dynasty, it was called "Horus of the Horizon" and "Horus of the Necropolis", the sun god that stands above the horizon. In later times, many sphinx images were carved in smaller sizes or in cameos with the faces of the reigning monarchs. The face of the Great Sphinx is believed to be that of Chephren, the fourth-dynasty pharaoh who built the second-largest pyramid in the Giza triad. In the image of the Sphinx, the pharaoh was seen as a powerful god. Carved out of a natural limestone outcrop, the Sphinx is 19.8 metres (65 feet) high and 73.2 metres (240 feet) long. It is located a short distance from the Great Pyramid. The main body sits along an east-west axis facing east. An enclosure of open floor surrounds the monument, narrowing somewhat in the western back end. There is an unfinished shelf along the western back wall slightly elevated from the rest of the enclosure floor. Large and small blocks of harder limestone, applied at different times in the past, form a protective covering or facing over the lower parts of the monument. The rectangular structure known as the Sphinx Temple lies directly east of the statue. Adjacent and south of the Sphinx Temple lies a structure known as the Khafra Valley Temple. This is linked to a causeway that goes west-northwest to the second or Khafra Pyramid. The causeway runs above and along the south wall of the Sphinx enclosure. A Khafra Mortuary Temple stands east of the Khafra Pyramid on the upper plateau behind the Sphinx. Plan of Khafre's causeway and the Sphinx enclosure. Originally, all three of the big pyramids at Giza (Khufu, Khafra, and Menkaura) had causeways, valley temples, and mortuary temples. These structures were originally faced with smoother and harder limestone or granite that was partly or entirely stripped in ancient and medieval times, leaving limestone core blocks that have weathered over the millennia. Between the enormous paws is a stele that records a dream Tuthmosis IV had when he was a prince. He dreamt that he stopped to rest in the shadow of the Sphinx during a hunting expedition in the desert. While asleep, the Sphinx spoke to him, saying that he would become king if he cleared away the sand that all but buried the Sphinx. When he became king, Tuthmosis IV cleared the sand and erected a stele that tells the story of his dream. After the work was completed, a chapel was built next to the Sphinx to venerate this sun god. "On one of these days it happened, when the king's son Tuthmosis had arrived on his journey about the time of mid-day, and had stretched himself to rest in the shade of this great god, that sleep overtook him.
' Behold me, look at me, thou, my son Tuthmosis. I am your father Horemkhu, Kheper, Ra, Tmu. The kingdom shall be given to you .... and you shall wear the white crown and the red crown on the throne of the earth-god Seb, the youngest (among the gods). The world shall be yours in its length and in its breadth, as far as the light of the eye of the lord of the universe shines. Plenty and riches shall be yours; the best from the interior of the land, and rich tributes from all nations; long years shall be granted to you as your term of life. My countenance is gracious towards you, and my heart clings to you; [I will give you] the best of all things. The remaining lines of text have been lost - but as Tuthmosis became Tuthmosis IV is, perhaps, not difficult to tell what happened!" "Now the statue of the very great Khepri (the Great Sphix) restin in this place, great of fame, sacred of respect, the shade of Ra resting on him. Memphis and every city on its two sides came to him, their arms in adoration to his face, bearing great offerings for his ka. One of these days it happened that price Tuthmosis came travelling at the time of midday. He rested in the shadow of the great god. (Sleep and) dream (took possession of me) at the moment the sun was at zenith. Then he found the majesty of this noble god speaking from his own mouth like a father speaks to his son, and saying, 'Look at me, observe me, my son Tuthmosis. I am your father, Horemakhet-Khepri-Ra-Atum. I shall give to you the kingship (upon the land before the living)... (Behold, my condition is like one in illness), all (my limbs being ruined). The sand of the desert, upon which I used to be, (now) confronts me; and it is in order to cause that you do what is in my heart that I have waited." Stonehenge was erected many miles from the quarry from which the stones came. It is an amazing feat of engineering, and many stories, both old ones and retellings, frequently name Merlin as this engineer. This is due largely to one Gerald of Wales (Giraldus Cambrensis), a historian of the 12th century, who wrote a book titled The History and Topography of Ireland. Baalbeck is a city in eastern Lebanon famous chiefly for its magnificent, excellently preserved Roman temple ruins. It was a flourishing Phoenician town when the Greeks occupied it in 331 B.C. They renamed it "Heliopolis" (City of the Sun) . It became a Roman colony under the Emperor Augustus in 16 B.C..On its acropolis, over the course of the next three centuries, the Romans constructed a monumental ensemble of three temples, three coutyards, and an enclosing wall built of some of the most gigantic stones ever crafted by man. Some tourists believe that the construction can only be attributed to extra-terrestial artwork . At the southern entrance of Baalbeck is a quarry where the stones used in the temples were cut. A huge block, considered the largest hewn stone in the world, still sits where it was cut almost 2,000 years ago. Called the "Stone of the Pregnant Woman", it is 21.5m x 4.8m x 4.2meters in size and weighs an estimated 1,000 tons. For centuries the temples of Baalbeck lay under meters of rubble, obscured by medieval fortifications. But even in ruin the site attracted the admiration of visitors and its historical importance was recognized. The first survey and restoration work at Baalbeck was begun by the German Archaeological Mission in 1898. In 1922 French scholars undertook extensive research and restoration of the temples, work which was continued by the Lebanese Directorate General of Antiquities. Baalbeck's temples were built on an ancient tell that goes back at least to the end of the third millennium B.C. Little is known about the site during this period, but there is evidence that in the course of the 1rst millennium B.C. an enclosed court was built on the ancient tell. An altar was set in the center of this court in the tradition of the biblical Semitic high places. During the Hellenistic period (333-64 B.C.) the Greeks identified the god of Baalbeck with the sun god and the city was called Heliopolis or City of the Sun. At this time the ancient enclosed court was enlarged and a podium was erected on its western side to support a temple of classical form. Although the temple was never built, some huge construction from the Hellenistic project can still be seen. And it was over the ancient court that the Romans placed the present Great Court of the Temple of Jupiter. The temple was begun in the last quarter of the 1rst century B.C., and was nearing completion in the final years of Nero's reign (37-68 A.D.). the Great Court Complex of the temple of Jupiter, with its porticoes, exedrae, altars and basins, was built in the 2nd century A.D. Construction of the so-called temple of Bacchus was also started about this time. The Propylaea and the Hexagonal Court of the Jupiter temple were added in the 3rd century under the Severan Dynasty (193-235 A.D.) and work was presumably completed in the mid-3rd century. The small circular structure known as the Temple of Venus, was probably finished at this time as well. When Christianity was declared an official religion of the Roman Empire in 313 A.D., Byzantine Emperor Constantine officially the Baalbeck temples. At the end of the 4th century, the Emperor Theodosius tore down the altars of Jupiter's Great Court and built a basilica using the temple's stones and architectural elements. The remnants of the three apses of this basilica, originally oriented to the west, can still be seen in the upper part of the stairway of the Temple of Jupiter. After the Arab conquest in 636 the temples were transformed into a fortress, or qal'a, a term still applied to the Acropolis today. During the next centuries Baalbeck fell successively to the Omayyad, Abbasid, Toulounid, Fatimid and Ayyoubid dynasties. Sacked by the Mongols about 1260, Baalbeck later enjoyed a period of calm and prosperity under Mamluke rule. The temple complex of Baalbeck is made up of the Jupiter Temple and the Bacchus Temple adjacent to it. A short distance away is the circular structure known as the Temple of Venus. Only part of the staircase remains of a fourth temple dedicated to Mercury, on Kheikh Abdallah hill. The first view the visitor has of Baalbeck is the six Corinthian columns of the Great Temple (or "Jupiter Temple") thrusting 22 meters into the skyline. Built on a podium seven meters above the Court, these six columns and the entablature on top give an idea of the vast scale of the original structure. The complex of the Great Temple has four sections: the monumental entrance or Propylaea, the Hexagonal Court, the Great Court and finally the Temple itself, where the six famous columns stand. The Temple of Jupiter is one of the most impressive Temples in Baalbeck. It measures 88x48 meters and stands on a podium 13 meters above the surrounding terrain and 7 meters above the courtyard. It is reached by a monumental stairway. Originally surrounded by 54 external columns, most of these now lie in fragments on the ground. The six standing columns are joined by an entablature decorated with a frieze of bulls and lions' heads connected by garlands. The Podium is built with some of the largest stone blocks ever hewn. On the west side of the podium is the "Trilithon", a celebrated group of three enormous stones weighing about 800 tons each. It was decided to furnish the temple with a monumental extension of the podium which, according to Phoenician tradition, had to consist of no more than three layers of stone. The fact remains that this decision initiated the cutting, transporting and lifting of the largest and heaviest stones of all times. Not only had a wall of 13 meters in height to be composed of three ranges of stones, but in the interest of appearance the middle blocks were made of a length four times their height. Adding to this a depth equal to the height of the stones, they had to be of a volume of up to 400 cubic meters per block, corresponding to a weight of almost 1000 tons. Technically, the builders of Baalbeck proved that they could do it, since three such blocks of the middle layer are in place, but in terms of time they did not succeed - the podium remained incomplete. Nevertheless, so awe-inspiring were those blocks to all beholders ever after, that Baalbeck was known for a long time primarily as the site of the three stones, the trilithon. The Great Pyramid has lent its name as a sort of by-word for paradoxes; and, as moths to a candle, so are theorisers attracted to it. The very fact that the subject was so generally familiar, and yet so little was accurately known about it, made it the more enticing; there were plenty of descriptions from which to choose, and yet most of them were so hazy that their support could be claimed for many varying theories." The Great Pyramid (the Pyramid of Khufu, or Cheops in Greek) at Gizeh, Egypt, demonstrates the remarkable character of its placement on the face of the Earth. The Pyramid lies in the center of gravity of the continents. It also lies in the exact center of all the land area of the world, dividing the earth's land mass into approximately equal quarters. The north-south axis (31 degrees east of Greenwich) is the longest land meridian, and the east-west axis (30 degrees north) is the longest land parallel on the globe. There is obviously only one place that these longest land-lines of the terrestrial earth can cross, and it is at the Great Pyramid! This is incredible, one of the scores of features of this mighty structure which begs for a better explanation. A total of over 2,300,000 (or only 590,712)* blocks of limestone and granite were used in its construction with the average block weighing 2.5 tons and none weighing less than 2 tons. The large blocks used in the ceiling of the King's Chamber weigh as much as 9 tons. Construction date (Estimated): 2589 B.C..
Construction time (Estimated): 20 years. Total weight (Estimated): 6.5 million tons. The estimated total weight of the structure is 6.5 million tons! Original entrance of the Great Pyramid. Massive blocks of limestone form a relieving arch over the entrance. The base of the pyramid covers 13 acres, 568,500 square feet and the length of each side was originally 754 feet, but is now 745 feet. The original height was 481 feet tall, but is now only 449 feet. The majority of the outer casing, which was polished limestone, was removed about 600 years ago to help build cities and mosques which created a rough, worn, and step-like appearance. Teotihuacan- 'The City of the Gods"
Teotihuacan means 'The City of the Gods", or "Where Men Become Gods"
(in Nahuatl). It is located in the valley of the same name 30 miles north of Mexico City. Though archaeologists have long been fascinated with the site, Teotihuacan's culture and history are still largely mysterious. The civilization left massive ruins, but no trace has yet been found of a writing system and very little is known for sure about its inhabitants, who were succeeded first by the Toltecs and then by the Aztecs. The Aztecs did not live in the city, but gave the place and its major structures their current names. They considered it the "Place of the Gods" - a place where, they believed, the current world was created. Teotihuacan used to be a thriving city and ceremonial center that predated the Aztecs by several centuries. Most likely it was Mexico's biggest ancient city at its peak and the sixth largest city in the world in AD 600. Teotihuacan began declining sharply around 650 AD, and was almost completely abandoned around 750 AD. No one knows why. The siting of the Pyramid of the Moon at the far end of the avenue was likewise done with such care that a sight-line directly over the top of the Pyramid of the Sun marks the meridian, thus allowing the priests of the city to fix the times of noon and midnight with complete accuracy. Besides the major ceremonial pyramids, there were also palaces and temples, especially near the north end of the city surrounding the plaza in front of the Pyramid of the Moon. These included the Palace of Quetzalcoatl, the Butterfly Palace, the Temple of the Feathered Conches, and the Palace of the Jaguars. The sophistication and artistry of the Teotihuacanos can be seen everywhere in the magnificent murals and stone carvings which adorn the walls of the palaces and apartment compounds. Teotihuacan's decline was almost as rapid as its rise to prominence. Even so, eight centuries later, Teotihuacan was still revered far and wide as an intensely sacred place. But no one remembered who had built it or that tens of thousands of people had once lived there. The Pyramid of the Sun, built in the 2nd century AD, dominates the landscape of the ancient city of Teotihuacan in Mexico.It is the third largest pyramid in the world and the largest in the Teotihuacan complex. A fascinating feature of some of the pyramidal structures is that they contain a broad, thick layer of mica, which had to be brought from Brazil, over 2000 miles away! Mica is very flaky and fragile, yet it was brought in very large pieces from great distances (and without wheeled vehicles). Then the mica was used on an inner layer of the pyramid, not where it could be seen. Why? One characteristic of mica is that it is used as an insulator in electronic and electrical things. Was that its purpose here? Another mystery of Teotihuacan. The Moon Pyramid is located at the northern end of the Avenue of the Dead, which is the main axis of the city. The pyramid, facing south, was built as the principal monument of the Moon Pyramid complex. The five-tiered platform was attached to the front of the Moon Pyramid. It is said that the present pyramid has interior structures within it. However, the pyramid still remains as one of the least understood major monuments in Teotihuacan. Originally there were three "walls" or "bulwarks" which foundations are still seen today; they are the most spectacular remains of that fabulous building that according to chroniclers did not have any comparison in the old world. They are three parallel walls built in different levels with lime-stones of enormous sizes; zigzagging walls that because of their appearance it is suggested that they represent the "teeth" of the puma's head that the complex represented. The boulders used for the first or lower levels are the biggest; there is one that is 8.5 m high (28 ft.) and weights about 140 metric tons. Those boulders classify the walls as being of cyclopean or megalithic architecture. Some authors believe that the three walls represent the three levels of the Andean Religious World: beginning from the bottom would be the Ukju Pacha (underground stage), the Kay Pacha (earth's surface stage) in the middle, and the Hanan Pacha (sky stage) on the top. Besides; those levels are identified with their three sacred animals: the Amaru or Mach'aqway (snake), the Puma (Cougar or Mountain Lion), and the Kuntur (Andean condor). Because of the zigzagging shape of the walls, some authors suggest that they represented the Illapa god (thunder, lightning and thunderbolt). It is possible that all the previous elements related to their religion would not be excluding, because there are divine interactions, and as it is known "three" was a key number among Quechuas. There are no other walls like these. They are different from Stonehenge, different from the Pyramids of the Egyptians and the Maya, different from any of the other ancient monolithic stone-works. The stones fit so perfectly that no blade of grass or steel can slide between them. There is no mortar. They often join in complex and irregular surfaces that would appear to be a nightmare for the stonemason. Scientists speculate that the masonry process might have worked like this: after carving the desired shape out of the first boulder and fitting it in place, the masons would somehow suspend the second boulder on scaffolding next to the first one. They would then have to trace out a pattern on the second boulder in order to plan the appropriate jigsaw shape that would fit the two together. In order to make a precise copy of the first boulder's edges, the masons might have used a straight stick with a hanging plum- bob to trace its edges and mark off exact points for carving on the second boulder. After tracing out the pattern, they would sculpt the stone into shape, pounding it with hand-sized stones to get the general shape before using finger-size stones for precision sanding. Admittedly, this entire technique is merely scientific speculation. The method might have worked in practice but that doesn't mean this is how the ancient Quechua stonemasons did it. There is usually neither adornment nor inscription. There is Elfin whimsy here, as well as raw, primitive and mighty expression. Most of these walls are found around Cusco and the Urubamba River Valley in the Peruvian Andes. There a few scattered examples elsewhere in the Andes, but almost nowhere else on Earth. Mostly, the structures are beyond our ken. The how, why and what simply baffle. Modern man can neither explain nor duplicate. Mysteries like this bring out explanations scholarly, whimsical, inventive and ridiculous. What is left from the three walls is made with lime-stones that in this case were used just in order to built the bases or foundations. The main walls were made with andesites that are blackish igneous stones which quarries are in Waqoto on the mountains north of San Jeronimo, or in Rumiqolqa about 35 Kms. (22 miles) from the city. Limestones are found in the surroundings of Sacsayhuaman but they are softer and can not be finely carved as the andesites of the main walls that were of the "Sedimentary or Imperial Incan" type. Destruction of Sacsayhuaman lasted about 400 years; since 1536 when Manko Inka began the war against Spaniards and sheltered himself in this complex. Later the first conquerors started using its stones to built their houses in the city; subsequently the city's Church Council ordered in 1559 to take the andesites for the construction of the Cathedral. Even until 1930, Qosqo's neighbours just paying a small fee could take the amount of stones they wanted in order to build their houses in the city: four centuries of destruction using this complex as a quarry by the colonial city's stone masons. Sacsayhuaman was supposedly completed around 1508. Depending on who you listen to, it took a crew of 20,000 to 30,000 men working for 60 years. Archaeologists tell us that the walls of Sacsayhuaman rose ten feet higher than their remnants. That additional ten feet of stones supplied the building materials for the cathedrals and "casas" of the conquistadors. It is generally conceded that these stones were much smaller than those megalithic monsters that remain. Perhaps the upper part of the walls, constructed of small, regularly-shaped stones was the only part of Sacsayhuaman that was built by the Incas and "finished in 1508." This could explain why no one at the time of the conquest seemed to know how those mighty walls were built. Garcilaso wrote that on the top of the three "walls" or "bulwarks" there were three strong towers disposed in a triangle. The main tower was in the middle and had a circular shape, it was named as Moyoc Marca (Muyuq Marka), the second one was named as Paucar Marca, and the third Sacllar Marca (Sallaq Marka); the last two ones were rectangular. This is the remaining base of a tower discovered in 1934 at the top of the Temple of Sacsayhuaman. The Muyuqmarka consists of three concentric, circular stone walls connected by a series of radial walls. There are three channels constructed to bring water into what many scientists consider to be a reservoir. A web-like pattern of 34 lines intersects at the center and also there is a pattern of concentric circles that corresponded to the location of the circular walls. In Cusco too, was the most important temple in the Inca empire, the Coricancha (meaning literally, "the corral of gold"). Dedicated primarily to Viracocha, the creator god, and Inti, the Sun god, the Coricancha also had subsidiary shrines to the Moon, Venus, the Pleiades, and various weather deities. Additionally there were a large number of religious icons of conquered peoples which had been brought to Cusco, partly in homage and partly as hostage. Reports by the first Spanish who entered Cusco tell that ceremonies were conducted around the clock at the Coricancha and that its opulence was fabulous beyond belief. The Coricancha (sometimes spelled Qoricancha) was also the centerpiece of a vast astronomical observatory and calendrical device for precisely calculating precessional movement. Emanating from the temple were forty lines called seques, running arrow-straight for hundreds of miles to significant celestial points on the horizon. Four of these seques represented the four intercardinal roads to the four quarters of Tawantinsuyu, others pointed to the equinox and solstice points, and still others to the heliacal rise positions of different stars and constellations highly important to the Inca. Rodadero hill is made up of diorite rock of igneous origin, where you can find waterways, carved rocks and what has been revealed to be the so-called throne of the Incas that is accessed by a series of precisely carved stairs. Behind this section there are small labyrinths, tunnels and vaulted niches in the walls. The Moai statues of Rapa Nui. In the early 1950s, the Norwegian explorer Thor Heyerdahl (famous for his Kon-Tiki and Ra raft voyages across the oceans) popularized the idea that the island had been originally settled by advanced societies of Indians from the coast of South America. Extensive archaeological, ethnographic, and linguistic research has conclusively shown this hypothesis to be inaccurate. It is now recognized that the original inhabitants of Easter Island are of Polynesian stock (DNA extracts from skeletons have recently confirmed this), that they most probably came from the Marquesas or Society islands, and that they had arrived as early as 318 AD (carbon dating of reeds from a grave confirms this). At the time of their arrival, the island was entirely covered with thick forests, was teeming with land birds, and was the richest breeding site for seabirds in the Polynesia region. Within a matter of centuries this profusion of wildlife was destroyed by the islanders' way of life. The reasons are today eminently clear. It is estimated that the original colonists, who may have been lost at sea, arrived in only a few canoes and numbered fewer than 100. Because of the plentiful bird, fish and plant food sources, the population grew rapidly and gave rise to a rich religious and artistic culture. However, the resource needs of the growing population inevitably outpaced the island's capacity to renew itself ecologically and the ensuing environmental degradation triggered a social and cultural collapse. Pollen records show that the destruction of the forests was well under way by the year 800, just a few centuries after the start of the first settlement. These forest trees were extremely important to the islanders, being used for fuel, for the construction of houses and ocean-fishing canoes, and as rollers for transporting the great stone statues. By the 1400s the forests had been entirely cut, the rich ground cover had eroded away, the springs had dried up, and the vast flocks of birds coming to roost on the island had long since disappeared. With no logs to build canoes for offshore fishing, with depleted bird and wildlife food sources, and with declining crop yields because of the erosion of good soil, the nutritional intake of the people plummeted. First famine, then cannibalism, set in. Because the island could no longer feed the chiefs, bureaucrats and priests who kept the complex society running, chaos resulted, and by 1700 the population dropped to between one-quarter and one-tenth of its former number. During the mid 1700s rival clans began to topple each other's stone statues. By 1864 the last of the statues was thrown down and desecrated. The barren lands and social strife that Admiral Roggeveen reported during his visit in 1722 make it difficult to imagine the extraordinary culture that had flowered on the island during the previous 1400 years. That culture's most famous features are its enormous stone statues called moai, at least 288 of which once stood upon massive stone platforms called ahu. There are some 250 of these ahu platforms spaced approximately one half mile apart and creating an almost unbroken line around the perimeter of the island. Another 600 moai statues, in various stages of completion, are scattered around the island, either in quarries or along ancient roads between the quarries and the coastal areas where the statues were most often erected. Nearly all the moai are carved from the tough stone of the Rano Raraku volcano. The average statue is 14 feet, 6 inches tall and weighs 14 tons. Some moai were as large as 33 feet and weighed more than 80 tons (one statue only partially quarried from the bedrock was 65 feet long and would have weighed an estimated 270 tons). There are curious connections between the Andes and Easter Island. For as long as we know, Easter Island has had the potato and the totora reed, both of Andean origin. In the oldest legends, Easter Island was called "The Navel of the World." Cuzco was called the same. The following statistics on Easter Island's moai are the results of Van Tilburg's survey in 1989. She reported, "A total of 887 monolithic statues has been located by the survey to date on Easter Island...397 are still in situ in quarries at the Rano Raraku central production center.....Fully 288 statues (32% of 887) were successfully transported to a variety of image ahu locations....Another 92 are recorded as "in transport," 47 of these lying in various positions on prepared roads or tracks outside the Rano Raraku zone." ROCK IT, standing up, side-to-side. Or, maybe try to ROLL IT, lying down, on round palm poles, or perhaps DRAG IT on its back. Among the many secrets buried in Easter Island prehistory is the question of how the Rapanui people transported the multi-ton statues, or moai, from their quarries to their final ceremonial ahu sites around the island. In many cases, the optimum route of transport would have meant that the teams of statue-movers, and the statues themselves, had to traverse several miles over very rough and hilly terrain. What would have been the best way to move Easter Island's stone giants, which weighed, on average, some 14 tons? The transport question has long been debated, and has been the subject of some experimentation by a growing arena of theorists. All have tried to approach the question as the early Rapa Nui people did, with the use of only stone, wood, rope, and human power. The following is a brief summary of those attempts. Like most oral traditions, Rapa Nui folklore has been passed down through the generations, and it is unknown whether the stories are based on historical fact. Most center on the mystical idea that the massive megaliths were moved using "mana," or divine power. Those who possessed mana were able to command the moai to walk to their designated places. Accounts of who actually possessed mana differ greatly. In 1919, Katherine Routledge, a British archaeologist who lived on Easter Island for a year, recorded in her journal: "There was a certain old woman who lived at the southern corner of the mountain and filled the position of cook to the image-makers. She was the most important person of the establishment, and moved the images by supernatural powers (mana), ordering them about at her will." Earlier accounts recorded by visitors to the island indicate that statues were ordered to walk by the mythical King Tuu Ku Ihu and the god Make Make. Even specialized priests were known to move moai at the request of those who wanted them on their family land or ahu. Machu Picchu is one of the few places left unscathed by the conquering Spaniards. Searching for more gold, Pizarro marched his men up the Urubamba River and around the horseshoe bend at the base of the mountain. Serenely perched 1500 feet above the thundering waters, Machu Picchu escaped the fate of most of the Inca empire. At some point, for reasons that elude us, life in the city ended and the forest took dominion. It was rediscovered in 1911 by a young American named Hiram Bingham. It is now generally thought that at the time of the conquest, knowledge of Machu Picchu had been lost by the Incas themselves. This hasn't stopped modern historians from somehow attributing its construction to Pachacutec, the 9th Inca who reigned in the mid 15th century, and gets credit for much of the achievements of that civilization. Hiram Bingham was told of a plant whose juices softened rock so that the surfaces would join perfectly. There are reports of such a plant, including this one by one of the early Spanish Chroniclers: While encamped by a rocky river, he watched a bird with a leaf in its beak light on a rock, lay down the leaf and peck at it. The next day the bird returned. By then there was a concavity where the leaf had been. By this method the bird created a drinking cup to catch the splashing waters of the river. Considering the fact that lichen softens stone to attach its roots, and considering the ongoing extinction of plant species, perhaps this isn't really such a far-fetched notion. Eric Von Daniken, in his series of books beginning with Chariots of the Gods theorized that the Andean stoneworks were built by Alien/Gods who visited the earth long ago, bringing civilization to primative man. The scientific community simply snickered. Whatever one thinks of his theories, he brought to the public an awareness of the many ancient monuments on earth that seem to defy rational explanation. "...there must have been days of light gravity in old times, when people could play tiddley winks with huge chunks of stone." Pedro de Cieza de Leon wrote of an old Inca legend about the creator-god, Viracocha. Once to show his power he caused a huge fire, then extinguished it. As a result of having been burnt so, the stones were so light that even a large one could be picked up as though it were made of cork. The structures at Machu Picchu are not as gigantic as those at Sacsahuaman, but some are surely finer. In a few cases, as in the "Temple of Three Windows" these walls stand among the most inspired structures created by man. The Bermuda Triangle (also known as Devil's Triangle and Devil's Sea) is a nearly half-million square-mile (1.2 million km2) area of ocean roughly defined by Bermuda, Puerto Rico, and the southernmost tip of Florida. This area is noted for a high incidence of unexplained losses of ships, small boats, and aircraft.. 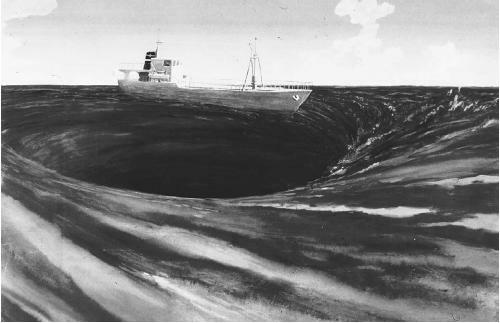 The Bermuda Triangle has become popular through representation by the mass media, in which it is a paranormal site in which the known laws of physics are either violated, altered, or both. While there is a common belief that a number of ships and airplanes have disappeared under highly unusual circumstances in this region, the United States Coast Guard and others disagree with that assessment, citing statistics demonstrating that the number of incidents involving lost ships and aircraft is no larger than that of any other heavily traveled region of the world. Many of the alleged mysteries have proven not so mysterious or unusual upon close examination, with inaccuracies and misinformation about the cases often circulating and recirculating over the decades. The triangle is an arbitrary shape, crudely marking out a corridor of the Atlantic, stretching northward from the West Indies, along the North American seaboard, as far as the Carolinas. In the Age of Sail, ships returning to Europe from parts south would sail north to the Carolinas, then turn east for Europe, taking advantage of the prevailing wind direction across the North Atlantic. Even with the development of steam and internal-combustion engines, a great deal more shipping traffic was (and still is) found nearer the US coastline than towards the empty centre of the Atlantic. The Triangle also loosely conforms with the course of the Gulf Stream as it leaves the West Indies, and has always been an area of volatile weather. The combination of distinctly heavy maritime traffic and tempestuous weather meant that a certain, also distinctly large, number of vessels would flounder in storms. Given the historical limitations of communications technology, most of those ships that sank without survivors would disappear without a trace. The advent of wireless communications, radar, and satellite navigation meant that the unexplained disappearances largely ceased at some point in the 20th Century. The occasional vessel still sinks, but rarely without a trace. It should be noted that both the concept and the name of the Bermuda Triangle date only to the 1960s, and were the products of an American journalist. Other areas often purported to possess unusual characteristics are the Devil's Sea, located near Japan, and the Marysburgh Vortex or the Great Lakes Triangle, located in eastern Lake Ontario.